Marta Studied Tai Chi & Martial Arts with Master Sam Tam for ten years. Master Sam Tams teacher was Zhang Qinlin-4th generation-Yang FamilyTai Chi Chuan. Sam Tam also studied with Dr. Chi Chiang Tao. Yi Chuan/ I Quan/ Dao De Cheng Sifu Sam Tam was a senior student with Master Han Xing Yuan of Wang Xiang Zhai's best known students. Sam Tam was also a senior of Lau Fat Mang( Eagle Claw Fame). He learned Shuai Chiao from Chang Dong Cheng and as a child Master Sam Tam began learning with General Zhang Xiang-WU, one of Grandmasters Liu Yun Qiao senior Baji desciples. General Zhang went on to teach Liu the old Yang Taiji style (as it was before Yang Cheng Fu standardized the form) and Kuen Wu sword form. SAM TAM Sam Tam (1940-) was born in Mainland China and is out of a family that for generations has specialized in martial arts and/or medicine. From childhood he grew a strong character combining intelligence, passion, perseverance and competitiveness. He started learning martial arts alreday in the 1940´s and because of his fathers occupation as a doctor in the Chinese armed forces, he learned from high level military martial art instructors. He is a living encyclopedia of knowledge, theoretically and practically. Among many of the things and persons he has learned from was Eagle Claw (Lau Fat Mang), Yiquan (Han Xingyuan, Yu Pengxi), Taijiquan ( Zhang Xiang Wu, Qi Jiangtao), Xingyiquan ( Han Xingyuan, Zhang Xiang Wu), Baguazhang ( Han Xingyuan, Zhang Xiang Wu), Shuaijiao ( Chang Dongshen), and many others … He is very, very skillful and never hesitate to give clear demonstrations of his abilities in the internal martial arts. And in contrast to many other well know teachers who only let their own students touch them or do pushhands with them during workshops and demonstrations, he always allows everybody to touch and feel him. No staged performances here! Theory is backed up with clear practical demonstrations. THE TEACHING LINEAGE OF WIND RIVER INTERNAL MARTIAL ARTS Sifu Jordan Misner is a long time student of Master Sam Tam (Tam Mann Yin) Sam Tam (1940-) was born in Mainland China and began his study of martial arts from childhood developing a strong foundation built upon upright character, self discipline, hard work and a passion for martial arts. His martial training began in the 1940s under the tutelage of very high level military martial art instructors that served with and knew his father (a physician) in Chiang Kai Shek’s Nationalist Army. Sifu Tam is a living encyclopedia of martial arts knowledge both in theory and application. As a result of his skills and aptitude for the martial arts Sifu has had the unique opportunity to learn from many of China’s highest level martial arts masters. His closest and most influential teachers include: Eagle Claw (Lau Fat Mang), Yiquan (Han Xingyuan, Yu Pengxi), Taijiquan ( Zhang Xiang Wu, Qi Jiangtao), Xingyiquan ( Han Xingyuan, Zhang Xiang Wu), Baguazhang ( Han Xingyuan, Zhang Xiang Wu), Shuaijiao ( Chang Dongshen), and many others I have been extremely fortunate to have learned from a master who is both as skilled at teaching as he is at his martial art. He teaches much like a mother bear teaching her cubs to hunt, very playful yet serious and practical. He has imparted his art, theory and feeling through form and function allowing me to feel in him and through him how the internal arts work. Without the direct transmission from teacher to student it is very difficult if not almost impossible to learn the internal martial and healing art of tai chi chuan. 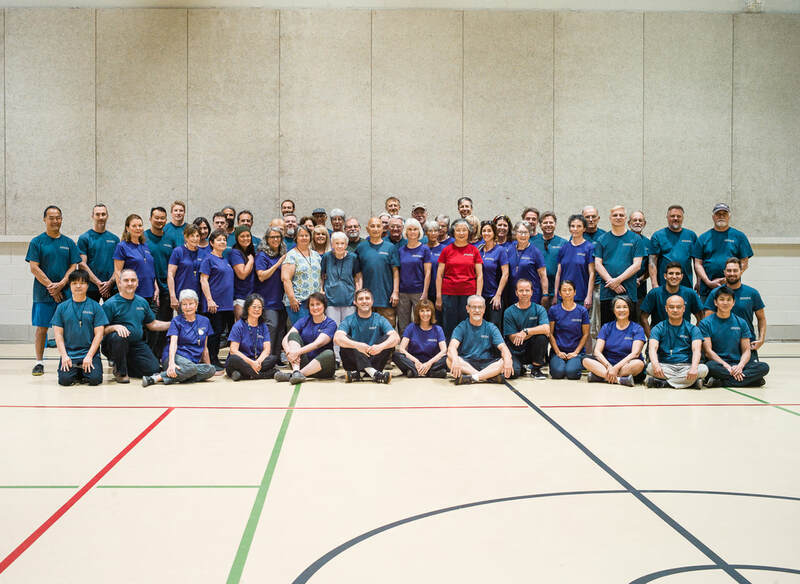 Sifu Tam is a living demonstration of how Tai Chi applied in your life can manifest in all areas of your being. What is taught at our school carries with it Master Tam’s signature of feeling and principles. It has been my very good fortune to have met and been invited to learn privately from Sifu Tam. I feel very fortunate have been given his trust and permission to teach his Internal Martial Arts to others for their health and enlightenment.